At the Defexpo 2016 fair held at Goa, Czech manufacturer of heavy-duty and special application trucks introduced the Force 8×8. Not many may be aware that the Indian Army operates more than 10,000 Tatra heavy vehicles. The Indian Army is historically one of the largest users of Tatra vehicles in the world and perhaps the largest outside of Czech Republic. The Czech manufacturer of heavy duty trucks, many of which are used for special applications including military usage, offered the Force 8×8 to the Indian Army at the Defexpo 2016 held in Goa in March 2016. The Force series of trucks stand out for their ability to tackle unprecedented terrain. Capable of fording up to 1500 mm depth, the Force series trucks are reliable and have an ability to drive in both extremely low and high outside temperature. Apart from ease of operation they also offer a long service cycle. The Force series marks an evolution in terms of Tatra all-wheel-drive vehicles currently operating in India, and ranging from 4×4 to 12×12 versions. Tatra Force vehicle series was introduced in 2004. In those days vehicles were marked as T 817 and later as T 815-7. It was in response to the requirements of the defence forces, especially after September 11, 2001, towards ensuring a smooth and fast transport of rubber-tyre vehicles over long distances, that a simple low cabin was developed. This would also help to consider the need to transport heavy-duty trucks by standard aeroplanes of the NATO armies. 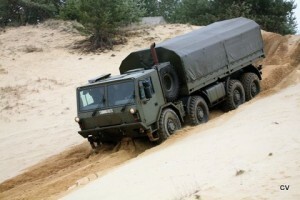 Tatra, in 2004, successfully demonstrated its expertise in modern narrow cabins, including installation of the latest technical features and technologies, such as a uniform oil filling system for the engine, automatic transmission and converter (SFS – Single Fluid System) as it developed the T 815-7E0R89 LVSR vehicle (Logistics Vehicle System Replacement) under a contract for the USMC (US Marine Corps). The five-axle chassis was designed to have the first and second axles mechanically steered using the “Tatravize 3000” (work of designer Dipl. Ing Antonín Bezděk) system. The fourth and fifth axles were designed to be hydraulically steered using a system that was jointly designed by experts from ZF. ZF experts were also instrumental in designing an all wheel drive system with selectable drive for the last axle. The design and development team also worked on a brand new model series in connection with the approval proceedings. If the Tatra medium-duty T 817 4×4 was powered by a Cummins engine and ZF transmission, the range was extended to include 8×8 and 6×6 versions in the next two years. Strong unification links between individual models are typical of the new range. The design allows for extensive variability of engines and driving mechanisms. 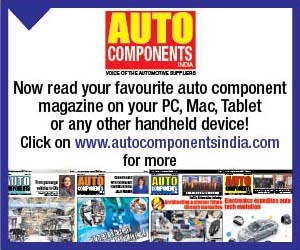 Apart from the air-cooled Tatra engines (V8, supercharged with air intercooler, meeting Euro II and Euro III emission standards without the use of an electronically controlled injection system), the vehicles can also be had with liquid-cooled Cummins or Caterpillar engines. Both, mechanically controlled and automatic transmissions can be had as well. The low structure of the cabin and the vehicle as such can be transported by a C-130 Hercules aircraft. The structure of the vehicle allows for additional armour plating of the cabin in various degrees of protection in accordance with STANAG 4569. In early 2015, Tatra 815-7 vehicles were rechristened as Tatra Force. An interesting part about the Force name is that it has been in use from 1999 through to 2014 for special vehicles (6×6, 8×8, 10×10 and 12×12) that use a cab and chassis from previous T 815-2 and power track, engine and transmission, from global producers such as Deutz, Cummins and Twin Disc. Vehicles that were original named as Force have been from the beginning marked as T 816 and T 815-6. Between 2003 and 2012, 3925 assembly kits were delivered to India. The kits were built and coupled with different superstructures according to the needs and requirements of the Indian armed forces. Because of the problems associated with a former major Indian stakeholder of Tatra, all the deliveries from Kopřivnice to India were stopped. A major breakthrough in Tatra’s return to India took place after the change in ownership structure. In 2013, Tatra was bought by Czech shareholders. 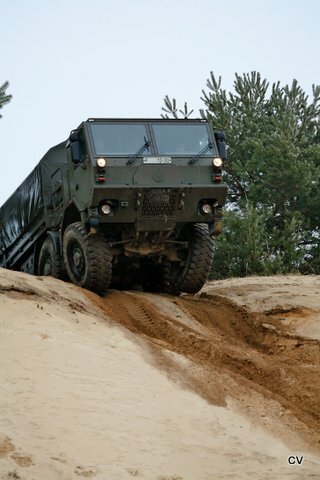 In February 2015, Tatra Trucks Company representatives signed a memorandum with an Indian state enterprise BEML Ltd. BEML Ltd., on behalf of the Indian armed forces, carries out the final assembly of the vehicles out of the CKD kits. Under the new ownership and a new management, Tatra Trucks supplied 100 vehicles to India last year. Most of these in CKD form. Tatra Trucks, on its own, invested in India almost a decade ago. 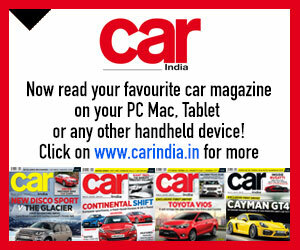 The Indian subsidiary is called Tatra India, and is mandated to develop aftersales services. 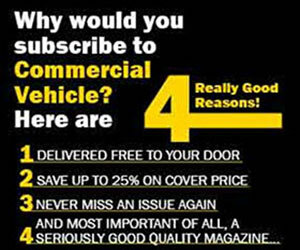 Proven quality, customer satisfaction and exceptional properties as well as the universality of the use of vehicles in diverse Indian conditions, Tatra Trucks, it can be claimed has found good acceptance. Tatra Trucks, this year, is aiming at supplying no less than 250 vehicles to India. These would be in different states of readiness for final assembly. 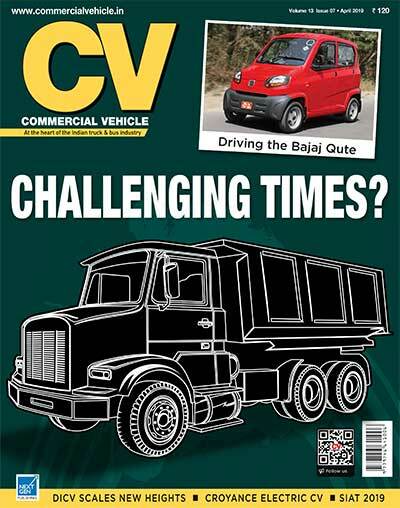 CV has been appointed an associate member of the International Truck of the Year (ItoY). 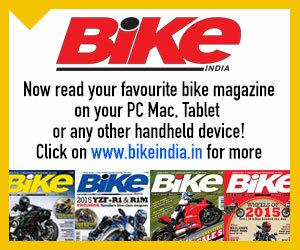 Being a part of this association gives the magazine exclusive articles, specially written for CV by IToY jury members.